A team led by Children’s National Health System clinicians and research scientists attempted to identify novel approaches to boost working memory in children who suffer from sickle cell disease. 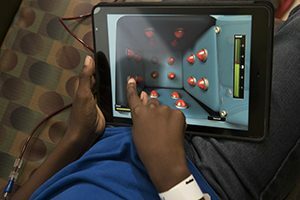 Youths with sickle cell disease who used hand-held computers to play game-like exercises that get harder as a user’s skill level rises improved their visuospatial working memory (WM). Children with sickle cell disease, however, completed fewer training sessions during an initial study compared with children with other disease-related WM deficits. A team led by Children’s National Health System clinicians and research scientists attempted to identify novel approaches to boost WM in children who suffer from sickle cell disease. Kids who have this red blood cell disorder inherit abnormal hemoglobin genes from each parent. Rather than slipping through large and small vessels to ferry oxygen throughout the body, their stiff, sickle-shaped red blood cells stick to vessel walls, impeding blood supply and triggering sudden pain. Children with sickle cell disease have more difficulty completing tasks that place demands on one’s WM, the brain function responsible for temporarily remembering information and manipulating that information to facilitate learning and reasoning. As a result, they’re more likely to repeat a grade, require special academic services, and to have difficulty maintaining employment as adults. Children’s National is home to the Sickle Cell Disease (SCD) Program, one of the nation’s largest, most comprehensive pediatric programs that cares for 1,350 patients younger than 21 annually. Over 15 months, the team recruited youths aged 7 to 16 participating in the program who had an intelligence quotient of at least 70 and an absolute or relative memory deficit. 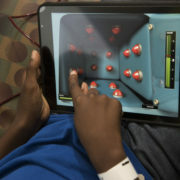 Those who lacked access to a tablet computer were loaned an iPad Mini 2 loaded with Cogmed RM, an interactive audiovisual cognitive training program that consists of exercises that get progressively more challenging. A clinical psychologist provided coaching and moral support through weekly telephone calls to review progress and challenges, and to offer tips on how to optimize the youths’ progress. Among those children who completed Cogmed, standard scores increased an average of 5.05 on a measure of visuospatial short-term memory, 19.72 on a measure of verbal WM, 27.53 on a measure of visuospatial short-term memory, and 23.82 on a measure of visuospatial WM. The researchers also observed a normalizing of memory functioning for those who finished Cogmed, as a significant portion of participants scored below the average range before using Cogmed and most scored in the average range or higher on memory tests after finishing the program.